So I decided to give Sun Chokes or Jerusalem Artichokes a try this year. Even if I don’t like them they will make good feed for my chickens. I have a 4′ x 8′ bed I made last year that I filled with compost from our township composting center. Even though we are still getting cold nights (it even snowed a little today) there were plenty of weeds growing in the bed, including stinging nettles. So I pulled them all out, raked the bed and planted the tubers I got from Amazon in the north half of the bed. Since I have such a problem with weeds growing up I over seeded the whole bed with Dutch White Clover. When I get vegetables to plant I will just cut a plug out of the clover and plant them in the opening. The comfrey I have planted is doing very well. I’ve already started cutting it to feed to the chickens and the chicks. This was planted two years ago and the plants keep getting bushier so I they are in a space that is good for them. There was a crew clearing trees for a road project last fall and I got them to dump a full truck of wood ships up at the front of my property, I just need to start moving them back to mulch around what is going to be my kitchen garden, if I get time to put it in this year. Many are the benefits of comfrey however in most of the country you cannot cut green leaves from sometime in the fall until well into spring, something like 4-7 months depending on how far north you are. 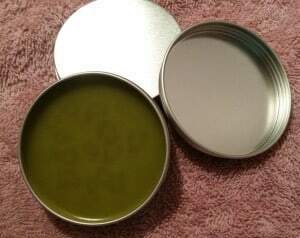 One option is to make comfrey oil and then turn that oil into a salve. I did this by taking a 2 gallon cheap stainless steel stock pot and filled it 3/4 of the way full with coarsely chopped comfrey leaves and then covered it with olive oil. I put a couple of bricks on my wood stove and set this pot on them. This provided a bit of space between the pot and the stove so it wasn’t as hot. This provided a gentle warming over several days and turned the olive oil even more green and gave it a different smell. Now I do not have any way to test this to determine how much of the comfrey goodness is infused in the oil, but this is the best I could do under home circumstances. The final step was to pour the contents of the pot into a sieve to strain out the leaves. I like something thicker than oil to apply to my skin so my next step is to add beeswax at a 1:5 ratio which produces a firm salve. I melt the beeswax first and add oil to it and re-heat as needed. Doing it this way means you do not need to get all the oil heated up to the melting point of the beeswax, them more oil you get incorporated into the melted wax the lower the melting point of the mixture. Lastly I don’t particularly care for the smell of the comfrey oil so I added enough Lavender essential oil to make the smell something I found more pleasing. My son has real problems with dry cracked skin on his hands during the winter so he will be applying this every night and we will see what happens.